Recent studies indicate that approximately 50% off cats and dogs in the U.S. are overweight, and 35% are considered obese. We all love our pets but we need to be sure we are not showing our love by giving extra food, treats, and table scraps. These extra calories could actually shorten their life, as overweight animals have been shown to have a shorter life-span than lean animals. Overweight and obese dogs and cats aremore likely to suffer from arthritis, diabetes mellitus, cardiopulmonary disease, hepatic lipidosis (fatty liver disease), pancreatitis, cruciate ligament rupture, increased anesthetic risk, and more. 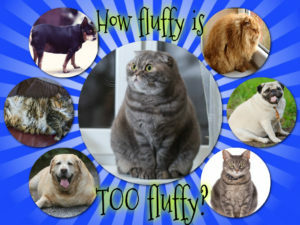 It can be hard to recognize if your pet is overweight since weight gain often happens gradually. A body condition scale has been developed to help assist in evaluation and determine how much weight your pet may need to lose to reach an optimum body condition. Diet and exercise are the keys to optimum weight but health conditions that can lead to obesity such as thyroid disease may need to be ruled out as an initial step towards a healthy weight. If you are concerned, that your pet may be overweight and would like to discuss a weight loss plan tailored to your pet, please contact us for an appointment.